This is a soft cookie with three Italian ingredients. The cookies are moist but have crunchy bits from the polenta. 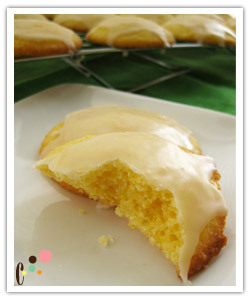 I used Giada De Laurentis's Lemon Ricotta Cookie recipe as a guide but I made several changes. Sift flour, polenta, baking powder and salt together and set aside. In a stand mixer or regular large bowl, beat butter for one minute. Add sugar and beat until fluffy, about 4 minutes. Using a rubber spatula, push down the butter and sugar mixture on the side of the bowl. Add the eggs one at a time. Each time you add an egg, make sure it mixes well (and spread the mixture on the side). Add the ricotta cheese, lemon juice, and lemon zest and mix to combine. Stir in dry ingredients from step 2 and combine. Line two baking sheets with parchment paper or Sil-Pad. Use a small cookie scoop or tablespoon, drop about 2 tablespoons of dough on the prepared baking sheet and shape them round. Bake for 16 minutes, until slightly golden at the edges. Remove from the oven and let the cookies cool on the baking sheet. Combine the powdered sugar and lemon juice in a small bowl and stir until smooth. Spoon 1/2 teaspoon of icing on the cookie and spread gently. Let the glaze harden before you serve.